If you’re climbing outdoors, maybe you’re trying to choose the best headlamp for rock climbing. Maybe you’re not even sure why you would need to take a headlamp rock climbing at all. 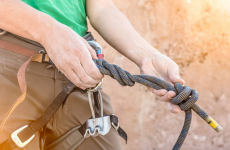 A headlamp might not seem like an obvious essential piece of rock climbing gear, but anything that gives you an advantage outdoors is worth taking a closer look at. 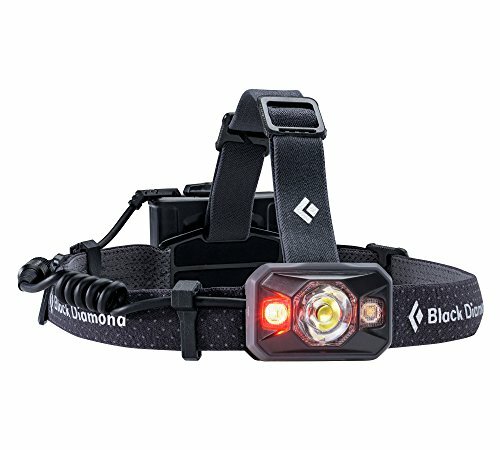 Do I need a headlamp for rock climbing outdoors? It is a good idea to pack a headlamp in your climbing pack every time you head outdoors. If you’re just starting to climb outdoors, you might not have thought about the reasons why you need one. The most obvious reason to get a headlamp for climbing is so that you can climb at night. Night climbing is a very different experience than climbing when the sun is out. You will only be able to see as far as your headlamp allows. 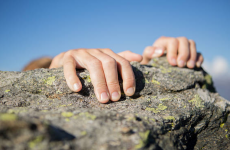 Even if you don’t actually plan on doing night-climbing, you could end up at the crag later than expected and have to do the walk back after the sun has gone down. It’s always easier to put on a headlamp when hiking out in the dark. Having a head-lamp is also great for getting the approach done in the very early morning hours before the sun even comes up. This is great when you have a long hike to get to the base of the climb and you want to be the first ones to get started on the wall. What different options are available with headlamps? When choosing a headlamp, there are many different options for light, battery power, comfort, and extra features. Let’s take a look at the most common options available. Different headlamps differ not only in the brightness the light provides, but there are differences in the patterns in the beam of light as well. The quantity of light that is put out by a light source is measured in lumens. Generally a higher number of lumens means more light is emitted. However, a larger number of lumens also takes more battery power to run, so keep that in mind when choosing the right headlamp. A wide beam, often referred to as a flood light or flood beam, is good for providing light for up-close activities, such as searching through your pack. They do not light up a long distance. A spot beam is a focused or narrow beam of light that allows viewing long-distance. This type of beam is best for seeing down a dark trail at night. A red light will illuminate your path but also let you keep your vision adjusted to the dark. A red light at night will allow you to see further peripherally than a white light, since your eyes will stay adjusted to see beyond just the path of the light. It is also less distracting to people around you. The ability to adjust between a wide and a spot beam makes a headlamp useful for more than one purpose, so this is a good thing to look for when choosing a headlamp. 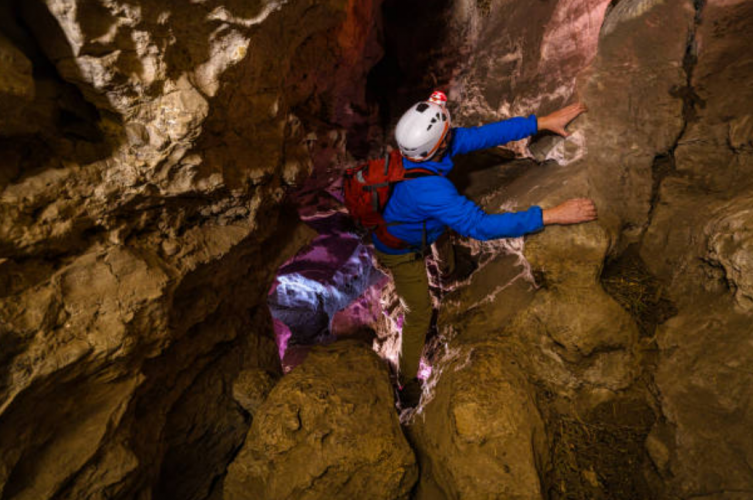 Reactive lighting is a newer technology in headlamps, which automatically dims or brightens the beam depending on how far away the object is that you’re looking at. Making sure your headlamp doesn’t run out of power when you need it most is the most important part of maintaining your headlamp. Knowing how long to expect your battery to last will make this easier. The power source options for headlamps is mainly a choice between rechargeable vs standard batteries. Some People prefer rechargeable headlamps because you don’t have to worry about changing batteries or buying new ones. Others prefer the ease of being able to carry a spare set of batteries to use if the headlamp is drained. There are also headlamps that include both a core battery that is chargeable, and the option to use regular batteries instead. On most headlamps, the manufacturer will list a run-time claim in number of hours. There aren’t really industry standards that specify how this claim is tested and verified. In most cases headlamps may last longer than the run-time listed, but the brightness will start to dim. Getting a headlamp that is comfortable to wear will make it more enjoyable to use, rather than just functional. Paying attention to size, weight, material, and strap configuration will help you find the headlamp that is perfect for you. There are a few extra features that you may not know you really wanted until you find yourself using a headlamp that doesn’t have it. Here are some of the best extra features to look for when choosing the perfect headlamp. Headlamps with any level of water resistance will have an ingress rating to classify the level of water protection that it can withstand. Anything rated IPX-3 and above will be able to withstand getting stuck in a torrential downpour. With an IPX rating, your headlamp will also be protected from dust entering it. If you’re looking to completely submerge your headlamp in water, like swimming or dropping it in a lake, you’re looking for at least IPX-7. Some headlamps provide an adjustable pivoting mount to let you better angle and aim your light once it’s secured and fastened on your head. While this is something that you can definitely live without, it makes using the headlamp a lot more convenient. Fumbling with tiny switches is often very hard to do if you happen to be wearing gloves of any sort. You may prefer a headlamp with a simple button that can control both turning on and off, and cycling between modes. A locking feature on your headlamp is great to have. It ensures that your headlamp doesn’t turn on accidentally while bouncing around in your pack, and drain all the battery power. A display showing how much charge in your headlamp, will let you know if you need to carry extra batteries or charge it up before the trip. The Black Diamond Icon Headlamp is a very powerful light source, rated at 500 lumens. There are multiple night vision modes including red, green and blue lights, covering the full spectrum. There are multiple light settings including flood, beam, dim, fog, and strobe. It also has a great and a very helpful brightness memory feature that lets you adjust the light and then turn it off and back on to the same setting. This headlamp comes with a lot of nice extras including a three-level power meter showing remaining battery life. The battery pack is a case for 4 AA batteries, and the batteries are even included. It’s easy enough to bring along spare batteries so you can always bring a full charge as backup. It also includes the lock feature so you don’t accidentally drain your battery. The Black Diamond Icon has an IPX6 rating for dust and and IPX7 rating for water. It is a truly great headlamp that provides lots of light and many top of the line features that will make you love it. 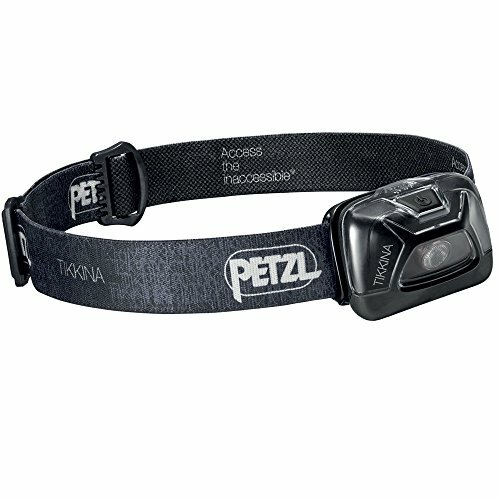 The Petzl Tikka RXP is a very popular and easy-to-use headlamp that offers 170 lumens of light. 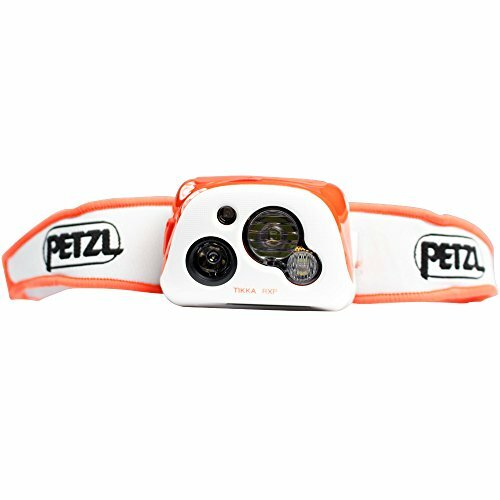 It has 3 light modes and also offers Petzl’s Reactive Lighting Technology. Reactive Lighting Technology automatically adjusts when you look into the distance, and dims when you face something up close. This keeps your hands free and once you get used to this feature you’ll wonder how you ever lived without it. It comes with a rechargeable lithium ion battery, chargeable by USB port. There is a lock so that you don’t accidentally drain power. The battery pack is also removable. This makes replacing your battery pack easy, as well as carrying a spare that you can keep charged up for emergencies. This headlamp is small, lightweight, and easy to pack. There is also optional software that you can download to let you customize the burn time. With so many great features, it’s easy to see why so many climbers use the Petzl Tikka RXP . The Petzl e+LITE Headlamp is the smallest and most compact headlamp that we could find. It is an ultralight headlamp weighing only 27 grams – including the 2 CR2032 batteries that come included with it. It has great basic features – 50 lumens of light, both white and red lights, a locking feature, and IPX7 water resistance. The Petzl e+LITE Headlamp is the perfect headlamp to stash in very small places. Due to its small size, light weight, and very affordable price, there is no excuse for not having one of these packed in case of emergencies. The Fenix HP25R has incredible lighting output – 1000 lumens with a lifespan of 50,000 hours. If you’re looking for the most light possible for you headlamp, you can’t beat its neutral white floodlight and far-reaching spotlight. 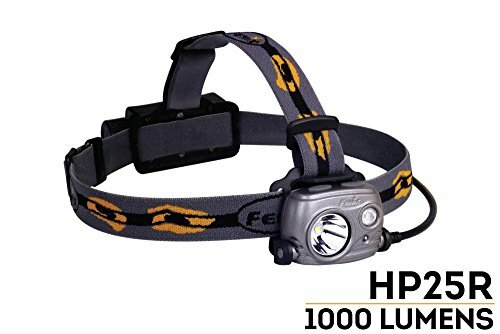 This headlamp has lots of other great features such as a 60-degree tilt mechanism to aim the beam easier, battery level indicator, red light night mode, and the option to use one 18650 rechargeable Li-ion battery or two CR123A batteries. It also has dual switch controls so you can control the the spotlight and floodlight separately. If you’re looking for a high-powered headlamp, it’s hard to find another headlamp that will light your path as bright as the Fenix HP25R. The Petzl Tikkina is our top pick for a really great value. It’s a well-made, dependable headlamp that supports up to 150 lumens. It has good basic features – 3 brightness levels, an adjustable tilt, and a single, easy-to-operate large button. The Petzl Tikkina comes included with 3 AAA batteries, but you can also get a rechargeable core battery separately to use with it. 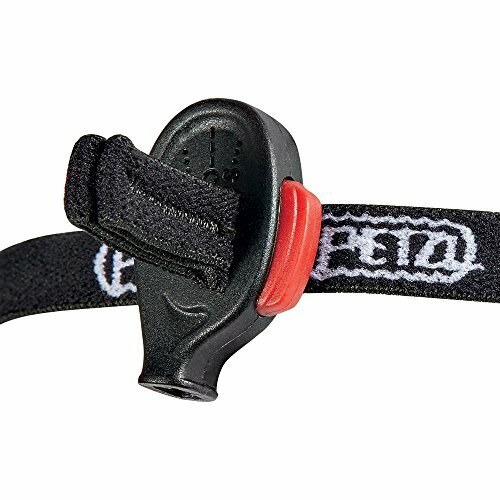 The Petzl Tikkina is small, compact, and durable. You can find it for an average price of $20.